Calling all sports fans and fanatics alike. Hanging a brand new colorful Neon Sports Sign in your sports bar, game room, den or pool house can add a new dimension to your gaming experience. 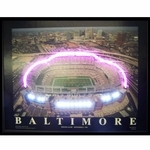 Showcase your teams colors with our huge assortment of NFL Neon Signs. If basketball is your thing, we also have a collection of NBA Neon Signs. If you like the action and fighting of the ice, our NHL Neons will fit the bill. Americas favorite pastime has always been baseball and you know we have a slew of MLB Neon Signs for your fancy. And of course, lets not forget your favorite college and university team logos featured in vibrant colors of real Neon. We also have a line of really gorgeous neon clocks with your favorite pro teams.